The VRA/VLA/VTA types are normally closed solenoid valves for cold combustion air regulation. When the coil is not energized the spring works on the disc, keeping the adjusted minimum passage of air. When powering the coil the valve opens, moving the disc to the maximum open position. 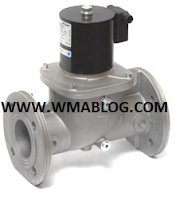 When power is switched off the valve moves to the minimum position. This type of device is suitable for high/low stage control of combustion air in industrial gas burners. (qualified for continuous service- 100% ED).